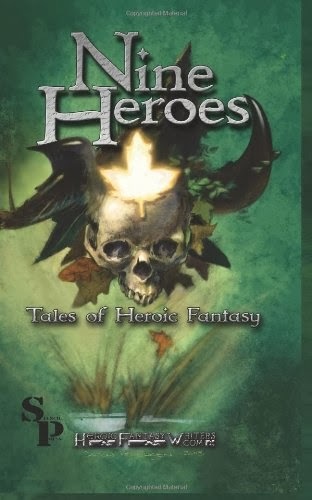 Nine Heroes Now Available On Kindle! What is that leaf about? Pel Rogue sliced a neat horizontal line into his opponent’s leg and knew the man was hamstrung. He batted the man’s sword away with contempt. Surgically, as he had been trained, he implanted the tip of his blade into the other’s shoulder. With a practiced twist he severed the vital muscles and tendons within the shoulder. The man would never use the arm again. The man fell to his knees, gasping for air through the pain that had just been inflicted upon his body. His eyes widened when Pel blade pressed his blade against his throat. Pel looked into them, trying to see if the man could see Death. There was only fear and pain. Calmly, easily, Pel rolled the blade around the man’s chin and up. He cut swift slashes into the man’s cheek in the shape of a triangle stood on its tip. The man would wear the scar till he died, and all would know that he’d gotten it at the hands of a Servant. It was a symbol few bore. All who did, the Marked, were useless invalids who could barely care for themselves. They limped throughout their towns and villages, a message to others to obey or suffer a similar fate. These will obey, thought Pel. He turned to survey the scene. Well, not the dead ones . . . The hard-packed dirt of the street, which was actually part of the Highlands Road, ran through the center of town. Along either side of the road were the shops of merchants, their stands laden with wares and bright signs painted with bright pictures so that potential customers could not miss the items they would not need. Not more than a quarter of an hour before the street had been a bustle of noisy activity. Now there was only the pained wheeze of the wounded man. Pel’s eyes fell on the eight corpses that littered the street. He had been fortunate that the men had come for him in two groups. A single rush of the nine would have taken him. No Servant, no matter how good, could take nine at once. That was a thing for the bard’s songs, for the legends and lies told around a fire. As it stood, the first two men to fall, the ones furthest from where Pel stood, each had a black hilt sticking out of their throats. Those had been lucky throws. He’d hoped to wound them, slow them down, and give him time to deal with the rest. That they were both dead had been more than fortunate. The other six dead men had required effort. They’d been fools not to use their superior numbers against him, but perhaps it was the myths of the Servants that had caused the second group to waste precious seconds. Pel has been able to swiftly, but carefully, deal with the attackers so that in addition to the disarming wounds he’d given them, each man’s head was neatly severed from his shoulders. It was important that others knew he’d killed the men intentionally; that there had been no quarter given and that their defeat was a simple matter. There were always others who thought to foment rebellion. The ninth man, the Marked man, was only a reminder if what had happened on this day. By law, he was now the town’s burden. They would feed him, shelter him, clothe him, keep him warm in the winters and pay for his medicine when he fell ill. He would live for a long while to keep the memories of other fools fresh with this picture. He’d spoken loudly, knowing there were eyes on him even if he couldn’t see them. Four eta pulled a hand cart nearby and began the distasteful process of loading up the dead men from the street. Pel ignored them. The town would pay for their services as well. “You’re a hard man, Servant,” an oily voice said at his side. Pershin was the tax-collector in the province. He fit stereotype perfectly. Greasy hair hung just below his ears, small beady eyes seemed to weigh and measure all things in terms of gold, silver and coppers. A sharp angular nose was set on a small face that seemed to lack a chin. His clothing was fair enough for his position, and Pel was certain Pershin had it tailored, but for some reason it still didn’t fit the man correctly. He was a short weasel, perfect for his job. You can also buy Nine Heroes in paperback! 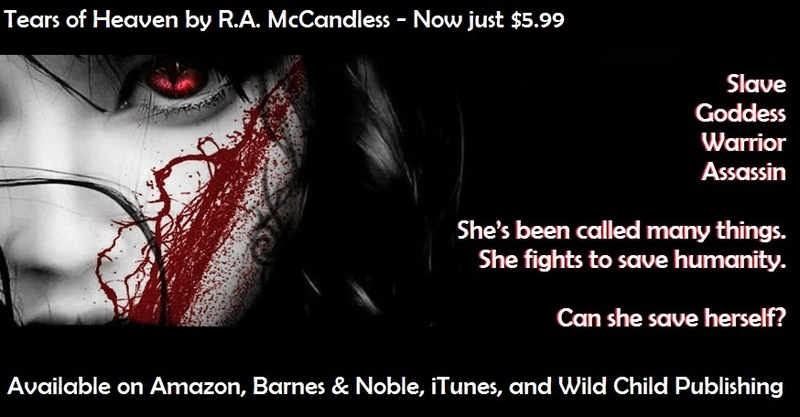 For more stories by R.A. McCandless, buy my urban fantasy Tears of Heaven! Tears of Heaven, by RA McCandless, is a fantasy novel with a different and interesting approach. While fantasy novels are common, most are based on Greco-Roman, Nordic, Asian, or Western European mythology. True, you can find them based on almost any mythic system, but the others are rare. McCandless’ Tears of Heaven is one of the rare ones, based on Judeo-Christian mythology. No, not the over-used end-of-days nonsense. He takes specific passages from the Old Testament, targeting sections people who’ve never read the Bible would be surprised at and many who’ve read it prefer to pretend aren’t there. Angels are shown not as protectors of humankind, but as the Old Testament presented them, heaven’s hit man. At times they’ve been presented in such a way in fiction, but not often, not usually as well, and seldom in ways as carefully based on Biblical passages. McCandless quotes some of the passages he bases his novel on. Tears of Heaven centers around one of the Nephilim, a child of a human woman fathered by an angel. In this novel the Nephilim have life spans of thousands of years. Del, a Nephilim, is employed by The Throne (call it heaven, God, a powerful angel, whatever) to eliminate rogues, fallen angels trying to gain power on earth. It isn’t the first time such a device has been used, but I’ve never seen it handled better. She isn’t happy with the job, but The Throne has blackmailed her into doing it. The surface plot is simple enough. 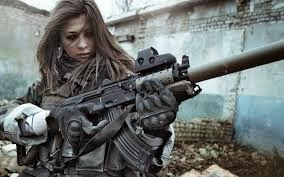 She finds a rogue, has a vicious fight with it, and banishes it. The concept could be boring, but McCandless doesn’t let it. Del’s mental conflicts, her interactions with other major characters, and the carefully-crafted personalities of those involved keep the reader interested and make Del a sympathetic protagonist. The action scenes, and there are plenty of them, are exceptionally well done. It’s a pleasure to find an author like McCandless who understands that the laws of physics are real. Mass is mass, velocity is velocity, and a few pistol bullets aren’t going to send a man-sized being flying backward or stop a charging demon. Kill it, maybe, but not before it has time to reach you. Actually Tears of Heaven is two novels combined, one dealing with Del in the ancient past, one set in modern times. Both are excellent and well interwoven, showing ways her earlier life influences her today. A few brief forays into ethics, philosophy, and theology, are somewhat pedantic if taken by themselves, but ultimately help explain Del’s character and behavior. If you like a well-constructed, fast-moving fantasy with interesting twists, I think you’ll enjoy Tears of Heaven by RA McCandless. 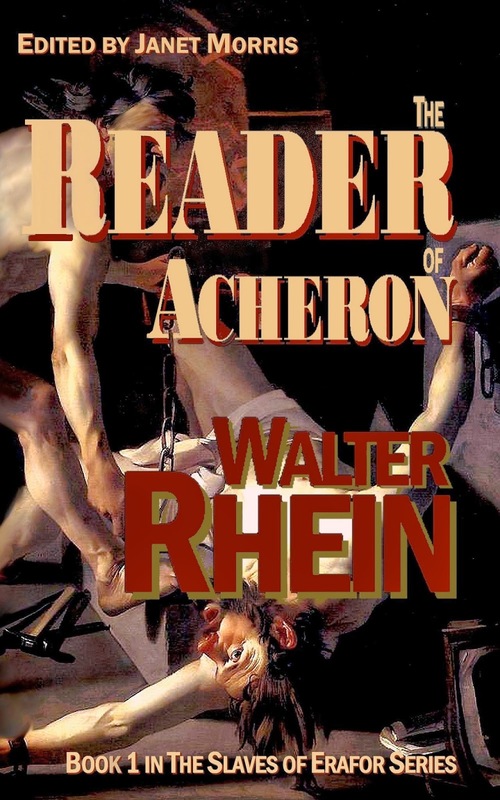 Walter Rhein’s “The Reader of Acheron (The Slaves of Erafor)” is an excellent introduction into a post-apocalyptic/dystopian fantasy work of intriguing characters and page-turning plot. Rhein reveals his world through the perspective of two main characters, who are both more alike than they know. Kikkan is a slave, who has known nothing but a slave’s life. In Rhein’s world, slaves are fed an addictive, mind-numbing drug called Bliss. Kikkan, however, has been kept off the drug because while it makes slaves passive, it also weakens them and rots their mind. Quillion, on the other hand, is a professional soldier, trapped in a world of soldiering and a hierarchy so oppressive that he’s not much better off than Kikkan. Abused by his superior officer, he and his friend Cole must flee into the wilderness to save their lives, and seek their destiny. Rhein does an excellent job developing the story and the characters, but it’s the background of his world where he really hits the home run. This is a place where reading, and books, are prohibited, sought out, and destroyed. It’s a fascinating, fantasy riff on “Fahrenheit 451” that he makes his own. The flow of his writing is very smooth, and the dialogue flows logically throughout. 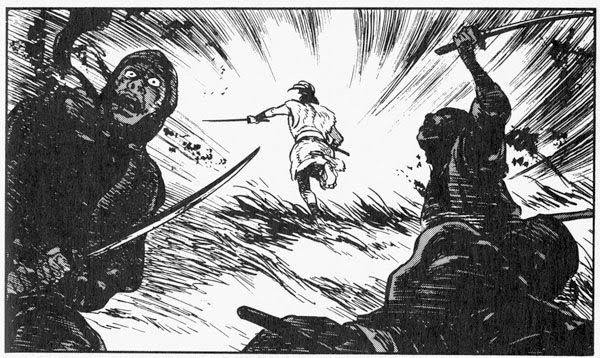 When Kikkan finds himself confronted with the choice of starving to death or attacking a carriage, he reasons out his choices before arriving at a decision. In “The Reader of Acheron (The Slaves of Erafor)”, Rhein brings to life the physical and mental struggle of characters thrust into a world they didn’t create, hungering for knowledge to make lives better, and matched by a mysterious hierarchy that seeks only ignorance and slavery. As Kikkan, Quillion and Cole battle their way through the obstacles, the reader will find themselves drawn into the adventure, and hungry for more. Nine Heroes Includes Yours Truly! Would You Mind Holding My Mainspring?